Zak Randell ’17 details a February moot court victory. If you’ve studied any antitrust law, you know there are three big players in the world of antitrust enforcement: the Department of Justice, the Federal Trade Commission, and, of course, the courts. 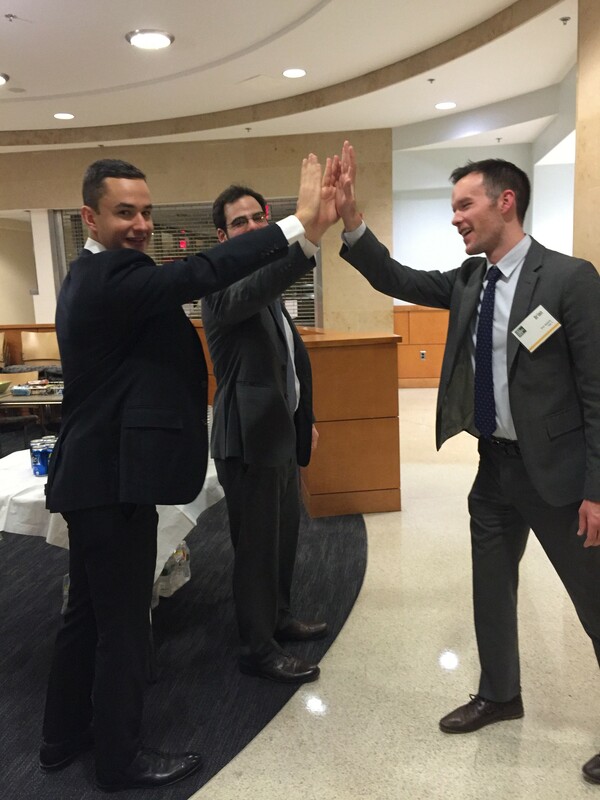 Two weeks ago Isaac Weingram ’17, coach Brian Desmarais ’16, and I got to argue before all three, representing NYU at the Global Antitrust Institute Invitational Moot Court Competition. For those interested (you’re forgiven if you’re not), the problem involved a proposed merger of two snow blower companies in the US and Canada that antitrust law had frozen in its tracks. Standing in the way was the Foreign Trade Antitrust Improvement Act (which really didn’t seem to have improved much of anything) and a complicated economic argument about customer welfare that, thankfully, Isaac was assigned to discuss. Due to the compressed timeline between our brief submission and oral arguments, the two-week period leading up to the competition was consumed with practice moots with our fellow Moot Court Board members and meetings with faculty to work out the weaknesses in our argument. During this time, we’d finished a moot in the late evening, only to awake the next morning, coffee in hand, to practice once again. While the time investment is sometimes taxing on your life outside of moot court, there’s no substitute for articulating and refining one’s arguments before NYU Law professors like Eleanor Fox ’61. The antitrust bar’s home is DC; all of our panels were composed of antitrust practitioners, including former and current attorneys with the Federal Trade Commission, who applied their deep familiarity with the underlying substantive law to challenge our arguments. Things got tougher from there. After breaking to the semifinals, we were grilled by a panel including the former head of the Canadian Competition Bureau, Canada’s equivalent of the FTC; the former assistant attorney general in charge of the Department of Justice’s Antitrust Division; and the executive director of the Global Antitrust Institute. These judges took us to task with their intimate knowledge of FTC internal regulations as well as substantive Canadian antitrust law, both of which undergirded some of our arguments. Much to our surprise, we prevailed in the semifinals and reached the grand finals. After a tense coin flip (never call tails), we were forced to make both of our final arguments “off brief,” meaning we were advocating for the side we had argued against in our brief. By this point, however, Isaac and I felt more comfortable—and, frankly, had more fun—arguing off brief for the defendants. All of our panels agreed that this was a harder argument to make, as holding for the defendants on either question would represent a large departure from the settled law. By the time I approached the podium for our final argument, a sense of calm settled in despite the three judges who stared down at me. The final panel was composed of Judge Douglas Ginsburg of the US Court of Appeals for the DC Circuit; William Kovacic, the former general counsel at the FTC and currently an antitrust professor; and Maureen Ohlhausen, a current FTC commissioner. We did our best to sway them as they kept us on our toes. I muddled my way through an extended exchange regarding Chevron deference, desperately recalling my 1L Legislation and the Regulatory State course, and Isaac brilliantly revealed his mastery of The Antitrust Paradox, a seminal work in the field. Our final panel was definitely the toughest on the competitors, but the most rewarding as well. Despite our naiveté (your humble author never having touched an antitrust casebook), after our argument the members of the panel were thrilled to discuss the finer points of the case, as well as other general developments in antitrust law. While our talented opponents ended up winning the trophy, the real joy at the end of the competition was getting to meet and argue before such accomplished and committed antitrust practitioners. And, perhaps more important, we laid the foundation for NYU’s triumphant return in 2017. This entry was written by Guest Blogger and posted on March 03, 2016.